We are pleased to present to you, the members of the 307th Bomb Wing B-47 / KC-97 Association, this history of the 307th Bomb Wing at Lincoln AFB. This history pays homage to those we served with and to those we lost. This project had its genesis a several years ago, at the time of our Memorial Bench dedication at the Air Force Museum. We found then that we had nowhere near a complete list of our aviation related casualties. Our remembrances were disjointed and somewhat inaccurate. Ernie Pence, our co-historian volunteered to see what he could do. After great difficulties, Ernie succeeded in obtaining microfiche copies of the official semi-annual wing history submissions from the Air Force Historical Research Agency at Maxwell AFB. He found that references to accidents or casualties were either not included or had been deleted. Also discovered was the fact that references to nuclear weapons had yet to be declassified, and that historical sections containing such references were not releasable to us. Thus, there is yet an unknown quantity of history still in the archives, awaiting declassification and not yet available to us. To complement the official Air Force records, we searched the archives of the Lincoln newspapers, and the former LAFB publication, the Jet Scoop. Several members sent in extensive files of newspaper clippings that helped immensely. In addition, Ernie obtained from US Strategic Command (SAC’s “successor” organization), historical overviews of our predecessor 307th units, and our successor unit, the 307th Strategic Wing. In our presentation of this to you, Ernie Pence has done all the hard work, and we all owe him great thanks. Several others have toiled also, checking and supplementing the information and editing it into publication form. Our history is intended to be a living document. It is presently incomplete. As we become aware of new information or corrections, we will incorporate those into revisions of this document. You have a role in this by calling to our attention, facts, stories, or other information that may have escaped our attention to date. Again, our thanks to our historians, Robert Loffredo and Ernie Pence. Finally, it is only appropriate that we dedicate this, our history, to those who lost their lives serving the wing and the nation. We owe them so much. We, the present living members of the 307th Bomb Wing B-47 / KC-97 Association, wish to dedicate this compilation of the history of the 307th Bomb Wing at Lincoln AFB, to our comrades who have gone before. Those, whose names follow, lost their lives through aviation-related accidents while serving the 307th Bomb Wing, or in subsequent service to their nation. The base was originally known as Lincoln Army Airfield and at one time had more than 20,000 military personnel assigned. Lincoln's first connection with the Army Air Corp. began during World War II, when it was activated as a training base for aircraft mechanics, and a deployment center for B-17 aircraft and crews headed for England. Lincoln Army Air Field was dedicated in October 1942. It later became a deployment center for B-29 crews for SE Asia, most headed for 20th Air Force on Saipan. The base was deactivated after the war in 1945. Lincoln AFB was reactivated in February 1954, and was assigned the primary mission of providing support for the 98th Bomb Wing and the Air Refueling Squadron. Less than one year after its reactivation the base increased two-fold when Congress decided to make it a double wing base. This increase came in October 1954 when the 307th Bombardment Wing returning from Okinawa was made part of the Lincoln strength. We of the 307th during 1954-66 saw much of the construction that occurred during WWII - the tarpaper shacks and the old-time barracks. Remember the old "ICE Box" we worked out of in the early days? "Chilly wasn't it?” Remember the above ground steam pipes which ran all over the base for heating? These are all gone now, as are most of the WWII buildings. Lincoln AFB was first placed under the command of SAC's 15th Air Force at March AFB CA. 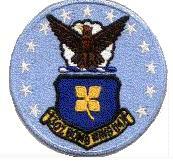 On 1 July 1955, the 818th Air Division was placed under the command of SAC's 8th Air Force at Westover AFB MA. Finally, on 1 January 1959, it was placed under the control of SAC's 2nd Air Force with headquarters at Barksdale AFB LA. April 1961, Lincoln AFB entered the missile age as the 551st Strategic Missile Squadron was activated and 12 Atlas "F" missile sites ringed the city of Lincoln and the base. These intercontinental missiles brought the assigned military strength of the base to 7,000 persons. The departure of the Division Headquarters and the 307th Bomb Wing came on 25 March 1965. The 551st was deactivated 26 June 1965. The first B-47's first arrived at Lincoln 7 December 1954, and they left exactly 11 years later on 7 December 1965. In addition to Lincoln, the following Nebraska airfields were active in WWII: Alliance, Ainsworth, Bruning, Fairmont, Harvard, Grand Island, Kearney, Scribner, McCook and Scottsbluff. Today, the Lincoln Airport Authority manages that which was the Air Base. A new commercial terminal was built in 1974 and a parking garage was added in 1988. The Nebraska Air Guard now flies KC-135 tankers out of Lincoln, after having flown F-86Ds and RF-4Cs previously. Former Air Force buildings are utilized by local businesses. It is a great economic asset to the city of Lincoln. Whoever reads this short history in the future can only imagine the climate of the times, the tense political situations, and the sacrifices in blood, sweat and tears. Because of the times we lived in, these men endured long hours of tedium and moments of terror while serving their country under a command that could not accept anything less than perfection. We bought you a short time of peace, how long it endures is up to you. Like the man says, if you love freedom, thank a vet. The 307th Bombardment Group (Heavy) was activated in 1942 by the Army Air Corps Combat Command after an attack on Pearl Harbor thrust the United States into war with Japan. In succeeding years, the 307th’s participation in World War II, the Korean Conflict, the Cold War, and the Vietnam Conflict proved it to be one of the most renowned bombing units in military annals. On April 15, 1942, the 307th began operations as a B-17 Flying Fortress bomber unit at Geiger Field, Washington. Its first mission -- to guard the northwestern United States and Alaskan coasts against armed invasion--prepared the group for its later role in the Pacific Theater of World War II. After patrolling the coastline of America for five months, the 307th’s B-17s were replaced with the famous B-24 “Liberators.” Subsequently, the entire unit was transferred to Sioux City, Iowa, for a brief training period. After completing a three-week B-24 familiarization program, the 307th relocated its entire cadre and 35 bombers to Hamilton Field, California. Three days later the B-24s deployed to Oahu in the Hawaiian Islands. An old Norwegian freighter slowly transported the remainder of the group to its “Pacific Paradise”. Upon arrival at Oahu, each of the group's four squadrons was assigned to a different Hawaiian location--the 370th to Kipapa, the 371st to Wheeler Field, the 372nd to Kabuka and the 424th to Mokaleia. Headquarters for the 307th was at Hickam Field. Finally settled at Oahu, 307th bombers began search and patrol missions over the surrounding Pacific area. Maintaining a 24-hour vigil, the bombers were to avert any naval attack against the Hawaiian Islands. Group bombers received their first taste of combat December 27, 1942. Twenty-seven of the group's aircraft were deployed from Oahu to Midway Island. From here, the B-24s staged their first attack against an enemy fortress on Wake Island. The enemy was taken by surprise during the predawn raid. Before Japanese units responded with a barrage of anti-aircraft fire, 307th bombers had blasted 90 percent of the Wake stronghold. All aircraft returned safely from what was considered the longest mass-raid of that time. It was from this mission that the 307th Bomb Group became known as “The Long Rangers”. The 307th moved to Guadalcanal in February 1943. From their new location on the largest of the Solomon Islands, group bombers attacked fortified Japanese airfields and shipping installations within the Southwest Pacific. At Guadalcanal, ground support troops were subject to massive air attacks by enemy bomber and fighter aircraft. On a warm day in March 1943, three waves of Japanese planes blasted the airfield, causing the greatest number of 307th casualties during the war. On November 11, 1943, the 307th participated in the largest aerial strike of the South Pacific War. In conjunction with United States naval elements, group bombers pounded enemy war and merchant ships at Rabaul, New Guinea. Amidst swarms of Japanese “Zeros” and heavy anti-aircraft fire, 307th aircraft released their bombs, leaving the port of Rabaul in complete ruin. Throughout the remainder of the war, 307th aircraft continued to cripple the debilitated enemy. Group elements neutralized Japanese forces at Yap, Truk, and Palau islands. Bombing strikes against Japanese shipping centers in the Philippines inhibited the enemy from gaining a further strong hold in the area. An unescorted attack by group aircraft against oil refineries at Balikapan, Borneo, October 3, 1944 helped assure an allied victory in the South Pacific. Following V-J Day in August of 1945, 307th aircraft ferried former American war prisoners from Okinawa to Manila. No longer needed, the group returned to the states in December 1945 and was subsequently deactivated. While in the Pacific, the 307th was awarded two Distinguished Unit Citations--one for an air strike against Truk on March 29, 1944 and another for a strike against the refineries at Borneo on October 3, 1944. The group was also awarded the Philippine Presidential Unit Citation for its active role in the Philippines campaign. In 1962, six of the wing’s B-47s were modified into EB-47s. They were dubbed “Pipe Cleaner” aircraft and their mission was to act as an airborne UHF radio relay platform for promulgation of the emergency action (Noah's Arc) messages. While at Lincoln, the 307th functioned as Combat Ready Unit, conducting combat training missions and maintaining an alert force commitment, both at Lincoln and overseas bases, until its deactivation on March 25, 1965. While at Lincoln AFB, some of the wing’s TDY and overseas Reflex stations were located in the UK at Lakenheath, Upper Hayford, Fairford and Greenham-Common, and in Spain at Moron, Torrejon and Zaragoza. In spring 1967, the wing added strategic bombing to its mission. Equipped with B-52D Stratofortresses and crews loaned from other wings, it began high altitude bombing of enemy targets in South Vietnam on April 11, 1967. Under the operational nickname “Arc Light,” wing bombers flew over 35,000 strikes against the communist enemy from 1967 to mid-1970. The 307th Strategic Wing was selected as SAC’s outstanding wing for 1972, and received the Omaha Award for its support of SEA operations. It was deactivated on 30 September 1975. The wing was awarded four Air Force Outstanding Unit Awards with Combat “V” Device, and twice was awarded the Republic of Vietnam Gallantry Cross with Palm. During its brief history in Southeast Asia, the 307th received three Air Force Outstanding Unit Awards--two of which were with other Eighth Air Force Units--for their role in the Vietnam Conflict. During its tenure at Lincoln AFB, the wing set records that may never be equaled again. It won a SAC Bomb Competition and participated in the Cuban Missile crisis. On October 1st 1959 the wing established a never broken SAC record for 2327 consecutive sorties without deviation from the flying schedule. 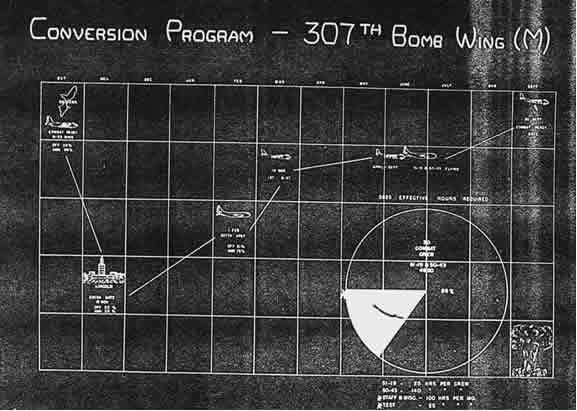 Years later, after the 307th was deactivated, a crew chief from the 307th received a letter from the last commander of SAC, and in that letter, Gen. Lee Butler referred to the unit as the “Famous 307th Bomb Wing”. A fitting tribute to a proud organization that performed its mission with style, determination and panache. The Mission of the 307th Bombardment Wing (M) was to organize and train a force capable of immediate and sustained long range offensive bombardment and air to air refueling operations in any part of the world, utilizing the latest technical knowledge and advanced weapons. What follows is a brief chronology of the 307th Bombardment Wing (M) from their last mission in Korea, through their conversion to SAC's first swept wing jet bomber, through their training and crisis missions, and their disbanding in 1965. The 307th was formed again as a tanker wing for the “Vietnam Conflict,” and later in the “Conflict” served as a “B-52 Wing” flying “Arc Light” missions. Men were lost while maintaining the peace during the “Cold War”, and some during the so-called “Conflict” in Vietnam. Crewmembers and Enlisted Men, all served with distinction and devotion to country that has been the hallmark of the United States Air Force since its inception. The 307th Bombardment Wing won SAC's coveted “Fairchild Trophy” in 1959 and set records that will never be equaled. Bear in mind as you read this chronology that the 307th was equipped with a sophisticated six-engine bomber. They were stationed in an area of the country that received all of the extremes of Mother Nature. Their mission became more varied and complex as adversary capabilities matured. They began their mission training to penetrate enemy air space at or above 35,000 feet. Later missions would see these brave crews flying at tree top level, popping up to obtain their target, making their bomb releases, executing high jink breakaways and dropping back down on the deck to dodge missiles and triple A. This country owes a great deal to these brave crews. Things happen very fast at tree top level at high speed. These men did not have the benefit of terrain following radar when these missions were flown. It is no exaggeration to say that these crews were true professionals. The B-52's got the headlines, but B-47's were the backbone of SAC! Word filters through the grapevine that a truce will be signed to end the “Korean Conflict” within twenty-four hours. The B-29's of the 307th are serviced; bombs and ammo loaded, preflighted, and take off for their last bomb run of the conflict. This is the 573rd mission of the conflict for the 307th. Colonel Austin J. Russell of Monett, Missouri led the raid. There will be a full eclipse of the moon before they reach the target. There are thunderstorms over the Yalu River so there will be no fighter opposition this night. The bombs are dropped and the wing returns to Kadena AFB, Okinawa. With this mission the 307th has flown 5,810 sorties and dropped 58,100 tons of high explosives in Korea during the conflict. The year 1954 witnessed the return of the 307th from Okinawa, and the depositing of their B-29 aircraft in the “boneyard” at Davis Monthan AFB in Tucson. Their advanced cadre arrived at Lincoln to start establishing the new 307th, and to prepare for the introduction of the new jet-propelled six-engined B-47. The 98th Bomb Wing was already in place at Lincoln, having reactivated the base from its post-WW II mothball status. Many personnel attended various B-47 training courses while enroute to Lincoln. Having flown recips, jet engines were an entirely new entity, as were the advanced electronics, radios, electronic countermeasures and bomb/nav systems proprietary to the B47. Tanker personnel started to arrive in midsummer, even though there were no KC-97s in place. The wing is flying training missions in the Pacific Theater of Operations. Colonel Fahy is to schedule the wing for bomb runs on the “Taeso Shoran” bomb range. He mentions the fact that the range has a few unknown factors: such as, the exact location of the island, the length of the island, etc. The advance party from Okinawa arrives at Lincoln AFB. All 307th Bomb Wing B-29's complete trip the from Okinawa to Davis Monthan AFB, where the aircraft were placed into the storage facility. What will become the 307th ARS is attached to the 98th Bomb Wing for support. The tanker squadron at this point is yet unnamed, with no aircraft in place. The aircraft arrived later from various locations, and many personnel came from the 380th Wing at McDill. Most KC-97 aircraft commanders had either KB-50 or B-29 previous experience. The 307th Bomb Wing is reorganized to B-47 unit authorization. The 307th Bomb Wing Headquarters is opened at LAFB. The first 307th Bomb Wing officers begin B-47 transition training. The 307th rear echelon departs Kadena AFB. Colonels Thorup and Hardin arrive at LAFB to assume their respective positions of commander and deputy commander of the 307th Bomb Wing. (Note: Col Thorup had earlier assumed command on 8 June 1954, while the wing was still on Okinawa). The operations and training section of the 307th Bomb Wing made preparations for the conducting the conversion-training program. (See appendix). The 307th ARS was officially activated as part of the 307th BW, and was then known as the “Paradise Squadron.” Later this year, they made their first 60-day deployment to Goose Bay, Labrador. The 307th is one of last wings in SAC scheduled to be transitioned into the B-47 Bomber. The first crews arrived from training at McConnell AFB at Wichita. The first training missions were flown from LAFB in March with the arrival of its first nine B-47's. B-47E 52-0054 uanable to stop after a brake chute failure. went of the end of the runway and was totaled. The crew, John Koudsi, A/C, Jim Evans, Nav, Dean Knight, CP, and 4th man Edward Seagraves, were uninjured. The 307th Bomb Wing comes under the command of the Eighth Air Force. While flying a “Red Cell” mission, Capt. Darwin was attempting to air refuel while penetrating some cumulus. The tanker, attempting to find a hole in the clouds, made several evasive maneuvers, which Capt. Darwin followed. In so doing his aircraft fell off the boom, stalled, went over on its back and went into a spin. Capt. Darwin recovered the aircraft, returned to the tanker and received the rest of his fuel. This was witnessed by the boomer. The boomer and the B-47 crew are filling out incident reports. Three graduation type missions were flown, and the wing’s official USCM Graduation Exercise, operation “Melon Rind,” was flown in October 1955. A note of interest in the Wing History states-there's nothing one can do about the weather. Nebraska is the land of extremes---when it’s hot, its torrid; and when it snows, it’s a blizzard. In any case you just don't fly! There were 43 B-47's and 21 KC-97 type aircraft assigned to the wing. There were 26 combat ready crews and 17 non-combat ready crews and 19 KC-97 combat ready crews. The 307th Bomb Wing participated in Operation “Swan Dive.” Valuable initial experience and confidence in navigating in semi-polar areas was accomplished. The wing suffered its first casualties, when a B-47 went down near Ceresco, Nebraska. Captain James W Sullivan, Lt Anthony C Marcanti, Lt Lawrence A Schmidt, and A1C James J Berry lost their lives. 307th Bomb Wing made its last ferry flight in connection with the replacement of its older aircraft. The Wing is preparing for deployment to Lakenheath in the United Kingdom. 15 B-47 aircraft departed Lincoln AFB on 3 July and arrived in the United Kingdom at Lakenheath, as scheduled. Due to a weather delay, the second and third waves of B-47's departed Lincoln two days later than the planned deployment date. The KC-97's deploying to Greenham-Common, were not so fortunate. Due to propeller difficulties they were delayed indefinitely. On Friday afternoon, Crew R-38 was involved in an aircraft landing accident in which all crewmembers were fatally injured. On board aircraft 53-4230 were the following officers and A&E technician: A/C Commander, Captain Russel R. Bowling; Co-Pilot, 2/Lt. Carroll W. Kalberg; Observer, 1/Lt. Micheal J. Selmo; A&E Technician, T/Sgt. John Ulrich. The aircraft was shooting touch and gos. On the fourth approach the aircraft porpoised, and a go around was attempted, but the right wing tip dragged and caused an explosive crash. The 307th Bomb Wing participates in operation “Pink Lady.” Target “Bravo” was the top of the Bell Tower of the Tower of London. Target “Golf” was the center of the bridge at Windsor Castle. During the first leg of their redeployment back to Lincoln, fifty wing personnel are lost aboard a Navy MATS C-118 enroute from Lakenheath to the Azores. An air/sea search was held for a week, with the only trace being two empty life rafts found off the northwest coast of Spain. Nine Navy crewmembers were also lost. A stunned base attended a Memorial Service at Lincoln on 29 October. In another tragedy, an ANG F-80, while landing, crashed into the flight line fuel pits, striking two parked B-47s, 52-369 belonging to the 98th BW, and 53-4235, a 307th aircraft. The F-80 pilot and two ground crew were killed, and four ground crew were injured. In 53-4235, two men were in the bomb bay changing a boost pump. A1C John Lawrence Delancey, Crew Chief, and A2C Donald Russell Price, Assistant Crew Chief, lost their lives, and the B-47 was destroyed. A1C Roger F Smith and A2C Melvin O Werschky, who were refueling the second B-47, escaped with burns. Chaplains V F Kullowats and L M Copeland Jr conducted a later memorial service, at which Colonel Thorup, the Wing Commander, laid a wreath, and Airman Wayne Powell rendered Taps. First Lieutenant Robert J Cox, 371st BS was later presented with the Soldier’s Medal for saving an airman’s life and preventing further damage to other aircraft. The 307th ARS is preparing for operations at Thule AFB, where it would pull a 90 day tour. 307th ARS A/C Commander Captain Everett G. Caudel is rated as pilot of the month in the 8th Air Force, for successfully landing his KC-97 aircraft with the nose gear in the full upright position. First Lt Robert J. Cox, 371st Bomb Squadron, was presented the “Soldiers Medal” for the outstanding heroism he displayed during a fire on the flight line in November 1956, when he saved the life of an Airman, and prevented further damage to an aircraft. One military disabling injury was reported in the Wing in November. This injury, with an estimated loss of 30 days and $900.00 occurred when A3C Vernon L. French Jr., 307th ARS fell on iced concrete while leaving his duty station and received a simple fractured skill. (TYPO appears thusly in the official Wing History records!). No horseplay was indicated in connection with this injury. The 307th Bomb Wing is involved in Reflex at Greenham-Common RAFB. The Wing shall maintain 5 aircraft on alert at this station on a rotational basis. The B-47 aircraft are to rotate approximately every 8 days. Aircraft 53-4226, a B-47 assigned to the 371st Bomb Squadron was involved in an incident concerning the Navigator’s ejection seat. The initial stages of the ejection of the seat occurred from movement of the rotational locks and leg braces in an unknown manner. This occurred during flight, which caused the Navigator some concern. During this year, the 307th ARS pulled a 90-day rotation at Ernest Harmon AFB, Newfoundland. In succeeding years they would also deploy to Lajes in the Azores, Malmstrom AFB, Montana; Edmonton, Churchill, Cold Lake, Frobisher, and Namao, in Canada; and Sondestrom in Greenland. The 307th Bomb Wing Reflexed to Greenham-Common with aircraft of the 98th and 310th Bomb Wings. They shall maintain an Alert Force there and at their home bases. In February, 307th crews participated in operation “Noon Day”. This operation supplied training for crews from the 307th and helped evaluate the defense capability of the 37th Air Division. Various radars were encountered and fighter opposition was F-84, F-89, F-94, F-100, and F-102's. Sweep jamming and burst chaff tactics were used. In February of 1958 the average alert response time at Greenham-Common for 15 aircraft was 4.5 minutes for Alfas, 7.7 for Bravos. A B-47 jettisoned both fuel tanks following a heavy weight takeoff and number 2 and 3 engine fire indications and wing overheat : one tank hit the Aero Repair hanger and the other struck a 98th BW B-47, 53-6204, being preflighted, killing the crew chief and an A&E repairman. Among those injured were A2C Clive D Wilson, 307th FMS, and the fuel tank driver.
" THIS IS COTTER PIN", PREPARE TO COPY, BREAK BREAK, THIS IS A PRACTICE, REPEAT PRACTICE, SAC ALERT. "TEAM PLAY" GROUND RULES APPLY. NOTIFY THE SENIOR COMMANDER PRESENT AND INITIATE ALERTING PROCEDURES. BREAK BREAK. TIME 0140 HOURS ZULU. YOUR AUTHENTICATION IS ___________ . During April of 1958 a near miss with a tower that was not on the sectional maps was a hair-raiser for a “Pop-Up” crew. It was near Wessington, Minnesota. The two towers were approximately 600 feet tall. In May of 1958 we began to send aircraft to depots for operation “Milk Bottle” for a wing strengthening modification so they would be safe for “Pop-Up” missions. General Sweeney, Commander of 8th Air Force, visited and was pleased with what he saw. In 1958, the Wing, having been directed to maintain one-third of its force on alert, found that more crews were needed. To alleviate this, a fourth bomb squadron, the 424th, was activated on 1 September, with Lt Col Walter F Duch as commander. The 424th had been part of the wing in WWII and Korea, but had since been inactive. The one-third alert posture also dictated a change in the maintenance concept. Until this time, all flight line crew chiefs and assistants were organic to the various bomb squadrons, which also had their own supply support. Crew chiefs were then consolidated into a newly created squadron, the 307th Organizational Maintenance Squadron, and squadron supply personnel were integrated into base supply. Lincoln and Little Rock were test wings for this concept, which was later implemented by all SAC wings. For several years, wing crews had practiced Pop-Up bomb deliveries starting from low altitude. However, in 1959, with the improvement of Soviet high altitude air defenses, training to provide SAC a credible low altitude penetration capability started in earnest. SAC initially designated seven low-level routes; each approximately 500 miles in length. Crews routinely flew the routes at altitudes between 500 and 1500 feet (unofficially, much lower), day and night. These routes were designated as “Oil Burner Routes” and are believed to still be in use for low-level training. During this period, the wing fulfilled a commitment of having one third of the force on alert. An overseas Reflex commitment was added in July of 1959. These commitments, combined with normal training requirements presented a heavy load, which many times resulted in crews being denied crew rest and time off. To try to make things better, SAC started experimenting with variations of the alert schedule. Initially, a crew was on alert for seven days at a time. Then, SAC experimented with 3 days on – 2 days off – 4 days on cycle for a while. This turned out to be not too popular: crewmembers would awaken in the middle of the night and have to concentrate to remember if they were in the alert barracks or at home. SAC then tried various other permutations of the alert schedule, but none seemed to work as well as the one-week tour. With the shorter, chopped up tours, much time was also frittered away on crew changes. Finally, SAC took an integrated approach to the problem of Alert – Reflex- training, and came up with the six week cycle as a guideline for crew scheduling (see “6 Week Cycle” in appendix). The 307th Bombardment Wing along with other units at Lincoln AFB, was transferred to the Strategic Air Command’s Second Air Force (2AF) headquartered at Barksdale AFB, Louisiana on 1 January 1959. The 307th Bomb Wing “Alert Effectiveness” was scored at 100 % in January 1959. The 307th ARS aircraft began rotation to LAFB from Ernest Harmon AFB, Newfoundland. The 307th Bomb Wing was directed to fly four aircraft in support of an Air Research and Development Command (ARDC) project (Swordfish) on 14 January and 23 January, four flights on each day. Swordfish flights were to assist radar calibration of the new SAGE air defense network. The effectiveness score for the 307th Bomb Wing’s Alert Force in February was 100 %. The 307th ARS shall support the 340th Bomb Wing, Whiteman AFB, Missouri during the period that the 340th is TDY to Lajes. A successful unit simulated combat mission coded “Team Scrimmage” was flown in conjunction with other flying training. In early October, the 307th participated in the 11th Annual SAC Bomb Competition, and came away with the grand prize, the Fairchild Trophy. One hundred eighty eight SAC crews participated in 94 aircraft: 20 B-52s, 27 B-47s, 20 KC-135s, and 20 KC-97s. Air refueling was included in the competition for the first time. Bomber events were staged from McCoy AFB, while the tankers flew out of Homestead AFB, both in Florida. Four crews, two bomber, two tanker, comprised the winning 307th team. 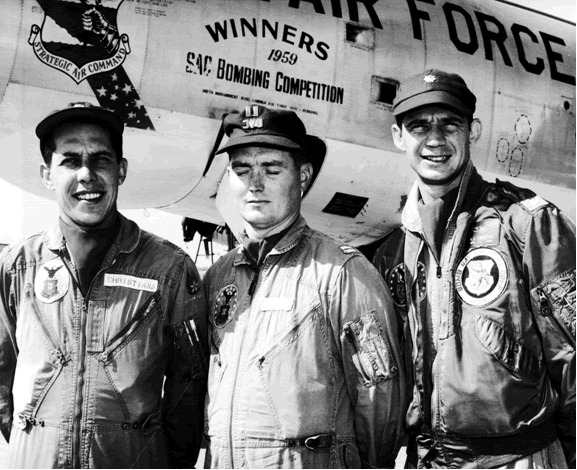 The two bomber crews were Mitchell, Norris, and Kinyon, and Christians, Timmons, and Jordan. The tanker crews were Normandin, McGill, Novetzke, Nikkel, and Kessler, and Jett, Reinhard, Monk, Bradley, and Martens. Five maintenance personnel received spot promotions for their outstanding job in the competition: Foster, Hall, Hoffman, Myatt, and Wise. Misfortune returned again to the 307th, when a B-47 performing an northbound ATO takeoff crashed right on the airfield. Major Paul R Ecelbarger, First Lt Joseph R Morrisey Jr, Captain Lucian W Nowlin, and Captain Theodore Tallmadge were killed. (See “AFT CG” in appendix). The 307th participated in operation “Red Mike” (team scrimmage), operations order 312-60, during November. This was a no-notice simulated combat mission and special weapons exercise. Generally the aircraft were to start refueling near Hastings Nebraska, start the Electronic Counter-Measures near Hibbing Minnesota, and start the navigation leg next to Hibbing but near the western most border of North Dakota. From there the navigation leg pointed toward Yellowstone National Park, then turn toward Oklahoma where the 4 ship cell was to fan out at Oklahoma City, to head for the pre-initial point at McCallister, Oklahoma. The initial point was at Fort Gibson, Oklahoma and the first target at Joplin, Missouri. The aircraft were then to swing into Kentucky and turn Northwest for the second target at Saint Louis and then return to Lincoln. The raw scores received from headquarters SAC gave the wing 97.5 % in generation, for a “satisfactory” score, 90 % in mission effectiveness, for an “outstanding” score, and 96.2 % in bombing reliability, for another “outstanding” score. RAMP FUEL LOAD 113,000 LBS. 113,000 LBS. GROSS WEIGHT RAMP 209,000 LBS. 204,000 LBS. & TAXI -3,000 LBS. -3,000 LBS. START ROLL GROSS/WT. 206,000 LBS. 201,000 LBS. LENGTH (MAX) 12,700 FT. 12,700 FT.
A new alert force facility was opened in April 1960, situated off the northwest corner of the main runway. It included a cafeteria, game room, TV room, briefing room, and crew quarters. The crew quarters were located underground, and were exited by several sloping tunnels toward the alert aircraft parking area. After base deactivation, the alert facility was torn down in 1970-71 when the FAA deemed its presence to be a hazard to both the main and diagonal runway. May witnessed the transfer of the 307th ARS to Selfridge AFB in Michigan. This was done as part of SAC’s plan for aircraft dispersal and to position the tankers farther along the EWO routes of the egressing bombers. The ARS remained at Selfridge until deactivated in 1964. The unit was later reactivated in KC-135 tankers and served through the Persian Gulf War. SAC started testing a B-47 dispersal program when in times of crisis, the aircraft would be deployed to civilian airfields and non-SAC military bases. A KC-97 on a northbound takeoff, lost directional control, collapsed the nose gear, and skidded off the runway into a refueling pit, where it was destroyed by fire. A/C Tom Hedges, CP Bill Novetzke, Nav Tom Artman and twenty-one others successfully evacuated the aircraft. There is a shortage of “Jet Mechanics” as Higher headquarters has directed that Jet Mechanics be used in lieu of vehicle operators. The result is that each flight line section while authorized 63 personnel, actually performs duty with approximately 40. During a “CoCo” alert, aircraft 53-2139 was taxing toward the active runway when the A/C felt a thud, but all instruments checked normal and he continued. Another A/C called a right outrigger fire on the aircraft. The tire had blown and left the rim. With a full EWO load, the rim soon ran down to the bearing and caused a fire. SAC aircraft participate in operation “Skyshield.” Aircraft of the 818th Air Division provide a simulated aggressor attack against the North American Continent. (This was a North American Air Defense Command exercise, which lasted for a 24-hour period. All civilian air traffic, including commercial airlines stood down for the duration of the exercise). Aircraft from the 307th Bomb Wing participated in operation “Clutch Pedal,” a test of the dispersal program. In the case of the 307th , two aircraft were flown to Chicago's O'Hare International Airport and two also to General Mitchell Field, Milwaukee Wisconsin. The 307th Bomb Wing was short by 36 men for the Jet Mechanic over 2 Engine AFSC. February witnessed the beginning of the SAC Airborne Command Post operations, dubbed “Looking Glass.” This operation continued unabated, 24 hours a day, until after the Gulf War. The 307th completed the first quarter of 1961 by again scoring 100 % in 50-8 training requirements. The 307th was required to fly a “Big Blast” mission once each month. The 307th Bomb Wing phase was to be referred to as “Tan Glove.” Specifically, SAC was to conduct B-47 and B-52 multiple aircraft penetration missions with maximum ECM. A B-47, 53-2111, making a southbound night takeoff was unable to attain sufficient flying speed and crashed just south of the runway, with only one crewmember surviving. Captain Russell Holst, Captain Albert Marinich, and Captain Allan Matson lost their lives, while Lt Thomas T Wesner successfully ejected. 3908th Strategic Standardization Group (SSG) visited the 307th Bomb Wing. This group was to administer flight checks and to evaluate the standardization activity of the wing. Specific areas checked by SSG included Alert procedures, take-off and climb, bombing, radar navigation, celestial and celestial grid nav, celestial assistance, safety, emergency procedures, electronic countermeasure procedures, instrument check, air refueling, traffic pattern, and landing. The only area listed that did not score 100 % was instrument checks, which scored 88.8 %. 30 August 1961, Lincoln AFB. Complete conversion of all aircraft for operation “Clip In” was completed as of 30 August 1961. This was a conversion of the bomb bay mounting racks, which enabled the aircraft to carry several new, smaller MK-28 nuclear weapons. The 307th fails an Operational Readiness Inspection (ORI): action taken for the next several months included key personnel changes, reorganization of one squadron, retraining and re-evaluation. An unpleasant time for all! The concept of "flying relay" stations came into being shortly after explosives ruined a radio relay station in Nevada in 1961. Contracts were let and two prototype B-47’s were modified to serve this purpose. First step in making this plan operational came in July 1962 when the four support squadrons were activated. The 4362nd Post Attack Command and Control Squadron (PACCS) was organized under the 307th at Lincoln, with Lt Colonel James M Pumford as Commander. “Pipe Cleaner” was the nickname for the operation and the aircraft. The mission of the 4362nd and the entire “Pipe Cleaner” system was to provide survivable UHF radio communication links between Airborne Command Posts and SAC aircraft over the Continental US and Canada. The 307th is released from probationary status, after an ORI recheck was conducted and passed. No engine changes caused by FOD for the entire month. Another entire month with no engine changes caused by FOD. It is discovered that poor bombing reliability on the “Steel Man Express Route”, was primarily caused by the poor quality of the 200 series air target chart. Release of Airmen held over for the Berlin Crisis caused some maintenance reliability and morale problems. On 12 June 307th officials were alerted to the fact that in accordance with the “Single Integrated Operations Plan” for fiscal year 1963 (SIOP63), 307th Reflex aircraft and crews would move to Greenham-Common, United Kingdom. First “Pipe Cleaner” missions flown by 4362nd PACCS (Post Attack Command and Control Squadron). Last of Reflex B-47's at Moron AFB switched to Reflex at Greenham-Common. Reflex tour for B-47 crews in Europe and North Africa would be 21 days instead of 28. On 4 September a message was received which outlined the responsibilities for two “Pipe Cleaner” B-47 aircraft and their participation in “Operation Dominic” nuclear tests in the Pacific. In response to President Kennedy’s missile crisis declaration to the nation, orders directed the initial dispersal of some 307th Bomb Wing personnel and aircraft to civilian airfields. Four aircraft were directed to General Mitchel Field, Milwaukee, Wisconsin, and 8 aircraft were ordered to Duluth Municipal Airport, Duluth, Minnesota. All Reflex deployments and redeployments were canceled during the “Cuban Crisis.” Crews were sent to the UK to man several B-47s, which had been reconfigured from training aircraft to EWO status. The remaining aircraft at Lincoln were generated to EWO configuration and were placed on alert. Base support personnel were used as augmentees with the security forces and in other direct support roles. Every aircraft had a guard assigned around the clock. This could be pretty tough duty at Zero Dark Thirty on a ten-hour shift, and one’s imagination could render up threatening things in the darkness. One young security guard augmentee lost it, and fired his carbine clip into the air. Those crews who dispersed to civilian fields found that initially, once in place, they were on their own, and had to rely on good old Yankee resourcefulness. To have their aircraft refueled, several aircraft commanders had to pull out their personal gasoline company charge cards to pay for the 10000 gallons or so that their bird devoured. Hopefully, SAC reimbursed them! Following conclusion of the missile crisis, the aircrews were ordered to return from their dispersal bases to Lincoln. One crew did not receive a properly authenticated “go home” order, and remained at their dispersal base, until they finally received a legitimate order, via a higher headquarters fly-in visit! There is a slight lull after the wing returns to normal operations after the Cuban Missile Crisis and the 307th prepares for “Pipe Cleaner” missions. During 1963, the wing Reflexed to both Greenham-Common and Brize Norton bases in the UK. As other wings shut down, additional aircraft and crews influxed into the 307th, until at years end, the 307th had sixty B-47s and over eighty crews. Captain Paul Pudwill and his B-47 crew were taking off at night in light icing conditions from McConnell AFB, Wichita, Kansas, following a weather RON, when Q-spring icing developed. This made the aircraft very difficult to control. Captain Pudwill attempted to return to base and ordered his crew to abandon the aircraft. He then realized he could not make the field and sacrificed his life while steering the aircraft free of populated areas. Captains Harry Jones, navigator, and Frank Medrick, co-pilot, successfully escaped the aircraft. In an oddity of nature, the force of the ejection tore the navigator’s gloves from the leg pocket of his flying suit, while the co-pilot’s weightier flashlight, also in his leg pocket, stayed with him. While landing in a snowstorm, a strong crosswind caused the B-47 to drift off the runway. The Aircraft Commander, Captain Paul Canney, attempted a go-around, but number six engine did not accelerate, resulting in asymmetric thrust and causing a wing to drag. As the aircraft was being wrestled to the ground by the A/C, the copilot, Captain Richard C West elected to eject, but his seat malfunctioned and he did not gain sufficient altitude for his chute to open before he hit the ground. Captain West perished from his injuries in the base hospital. Canney, Lt Don Hickman, the navigator, and SSgt Bobby Odom survived the crash, uninjured. Major N V (Jim) Meeks is killed when his lap belt fails to open because a gas port was not drilled when it was manufactured. The B-47 experienced a fire on the aft fuselage during an “ATO” take off. He was known to his squadron friends as “Old Soldier Meeks”, and to the crew chiefs as “Tiger Jim Meeks” for his salty conversation during preflights. Meeks held the aircraft under control while his crew bailed out, before he attempted ejection. The navigator, Clifford Cork and the copilot, Larry Talovich, ejected successfully, and the fourth man, Arthur Ingle, a second copilot, successfully exited via the entrance hatch. “ Noah's ARC” (Pipe Cleaner) aircraft are experiencing wet transmitters after all missions, problem turned over to OCAMA. EB-47L aircraft at Mountain Home AFB, are not experiencing wet transmitters. The 307th has 60 B-47 aircraft assigned at the end of October 63. Only 45 of these aircraft are authorized, with 47 actually possessed by the Wing. Lt Colonel James M. Pumford, 4362nd PACCS Commander, retired from the Air Force. Lt Colonel Russel M. Heller, Jr. then assumed command of the 4362nd. He was formerly with the Wing’s 371st Bomb Squadron. This year saw the wing Reflex commitment transition to Zaragoza AB in Spain, with the result that 15 B-47s were on home alert at Lincoln, and 10 on alert at Zaragoza. Even though preparing for deactivation, the wing was directed to practice nighttime Minimum Interval Takeoffs (MITO), which can be a hairy maneuver, even in daytime. In an 18 month time period, the wing experienced four ORIs. The 307th Bomb Wing is awarded the Revere Bowl and three Square Boxes for the best “Bar None” July through December 1963. The 307th received an excellent rating on the ORI, which began on April 6. The 307th terminated Reflex operations in preparation for deactivation. The Wing is sending “high hour” aircraft to Davis Monthan for destruction. Wings that are deactivating are sending their low hour aircraft to the 307th. A B-47, 53-2366, performing a southbound takeoff failed to accelerate to flying speed and crashed off the end of the runway. Captain Thomas E Sutton, First Lt David C Williams, First Lt Terrance P Murphy, and Major John F Sakry, all perished. The last Bar None ORI was flown by the wing against a target at Kirksville, Missouri. The wing bombing results were so outstanding, the SAC Director of Operations sent a message to all B-52 units admonishing them because older aircraft, with outdated equipment, scored better than they had. The wing was released from its alert force commitment in preparation for deactivation. The 307th Bombardment Wing begins deactivation at a rapid pace. They send their B-47's to Davis Monthan AFB where in an earlier era, they had deposited their B-29's. The last B-47 off the Boeing production line, number 53-6244, was prepared for a trip to its final resting place at the Air Force Museum at Wright-Patterson AFB, Ohio. This aircraft was also the bird depicted on the cover page of the Dash One. For weeks, ground crew members cleaned and polished it so well, that it picked up 10 additional knots of airspeed in flight. A departure ceremony was held, and on 22 January 1965, Gene Hickman, Pete Todd, and Al Ottaviano, accompanied by Crew Chief Jim Sine, flew the bird to Wright-Patt. Painted on the side of the plane were the names of a different crew: Mitchell, Gerber, and Evans, who were not available to perform this last mission. For several years, 6244 was displayed in front of the 17th Bomb Wing HQ at Wright-Patt. The Museum people were unable to take 6244 to the newly built Museum complex because of highway obstructions. When the 17th BW closed, 6244 was towed to an area of repose, and was used for fire department training, whereupon it was destroyed. Talking to Curators at the AF Museum, one learns that the demise of 6244 is a very sore point because the B-47 the Museum has on display is a former research aircraft, and not a real B-47E. The 818th Air Division and the 307th Bomb Wing are deactivated. Many crews remaining are transferred to the 98th, and remain at Lincoln until the 98th is deactivated and the base closes. The last B-47 departs Lincoln, 11 years to the day after the first one arrived in 1954. Summary historical information provided by Vince Giroux, Historian, USSTRATCOM J077. Microfiche films of the 307th Bomb Wing (M) official history reports provided by the Air Force Historical Research Agency, Maxwell AFB, AL. Air Force Combat Wings, Lineage and Honors Histories, 1947-1977. Charles A Ravenstein, United States Air Force Historical Research Center, Washington DC, 1984.